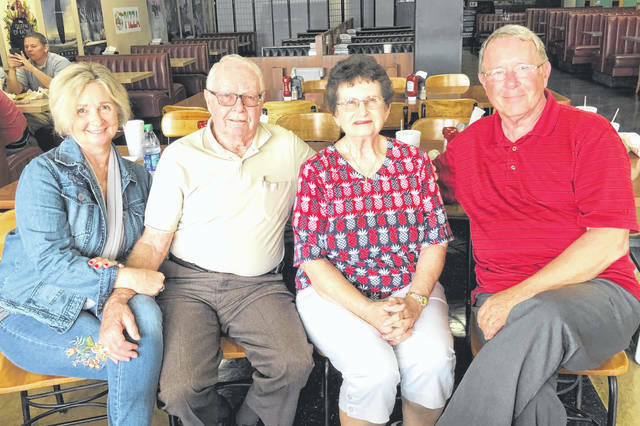 John and Nancy Abernathy of Hillsboro celebrated their 65th wedding anniversary Wednesday. They were married on Sept. 19, 1953. They are pictured at a recent family gathering with their daughter, Ann Morris, and son, Gary Abernathy. https://www.timesgazette.com/wp-content/uploads/sites/33/2018/09/web1_Abernathy-anniversary-this.jpegJohn and Nancy Abernathy of Hillsboro celebrated their 65th wedding anniversary Wednesday. They were married on Sept. 19, 1953. They are pictured at a recent family gathering with their daughter, Ann Morris, and son, Gary Abernathy.